Oh my... That's gonna haunt me tonight. O_O Honestly, aside from being bad, it's just downright creepy. Woah I'm...I'm....There's no words in any language to describe it O_O. Hell, I'd like to have it just because its so...retro. And probably very soft! Someone should put this next to that freaky MegaMan.EXE head. I hope that thing died in a huge ball of flames that left no trace of remains. 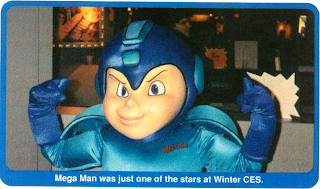 Poor Megaman's visage just doesn't translate well to costuming...Still beats that dead-eyed promotional abomination mentioned in the early days of your blog. That's nowhere near as bad as the old old megaman costume, the one that the head looks like paper mache. "If Looks Could Kill" Mega Man's future... Yes. The other costume is the one they showed on capcom unity a while back, it was on this blog too I think. I can't get to unity from here (work) so I can't pull it up to get the URL. Whoa that's the most suprising comment I've seen about something so creepy! I remember this from that one Nintendo Power mag where they were advertising Tiny Toons Adventures for SNES! And it even had quite a few Mega Man games in the Nester awards, there was a Starfox comic, and the cutout Arwing! Mega is pretty hard to get right in a 3dimensional form. I've been working on a 3D model of him and it's pretty hard to get his face to look the way it should from all angles. There's always some angle in which his face seems off. Really annoying. Oh god, i so remember that. I used to get that magazine all the time back then.... i still remember when that one came out.